The HA-2SE's power amplification circuit for the headphones is Class AB built with integrated circuits (ICs) and discrete transistors. The discrete transistor output stage uses hand-picked and matched parts. The output transistors are biased to operate in their most linear range for the critical small signal, and deliver their full potential when power is required. There is no DSP (Digital Signal Processor) in the HA-2SE. Volume control is operated by a combination of the DAC chip's internal digital volume control and an analog potentiometer (the familiar volume knob). Bass boost is performed by pure analog audio circuits. By avoiding re-digitizing the audio signal for volume adjustment or bass boost, the HA-2SE provides a clean signal path for the audio. The HA-2SE has a 3.5 mm Audio-In port to support portable music players that do not have a USB-compatible digital output. While the HA-2SE is used with one of its USB digital input ports, the 3.5 mm jack acts as Line-Out for the USB DAC. The DAC is one of the most important components for digital audio playback. The ES9028-Q2M DAC chip used in the HA-2SE is the latest flagship mobile DAC developed by ESS Technology. With the ESS patented 32-bit Hyperstream™ DAC architecture and Time Domain Jitter Eliminator, the SABRE32 Reference DAC delivers an unprecedented performance for mobile applications. By bypassing the smartphone's built-in DAC and headphone amplification circuit that are often cost-constrained, the HA-2SE turns a smartphone into a high performance digital audio player. The asynchronous USB DAC input of the HA-2SE also works with PC and Mac computers to replace the built-in sound card and support high-resolution audio playback with PCM up to 384 kHz 32-bit and DSD up to 12 MHz (DSD256). For those who like a bit more punch and impact with their music, the HA-2SE offers a Bass Boost function. With Bass Boost off, the HA-2SE delivers a ruler-flat frequency response; with Bass Boost on, the HA-2SE adds force and impact to the sub-bass region without muddling the important mid- to high-frequency bands. The HA-2SE offers two gain level settings for optimal headphone matching. The High Gain mode is capable of driving large power-hungry headphones, delivering up to 300 mW into 16-Ohm headphones. The Low Gain mode is intended for sensitive In-Ear Monitor type earphones. The HA-2SE passes Apple's "MFi" certification and is compatible with the latest iPod, iPhone and iPad to be used as the digital audio output accessory of these devices. By tapping directly into the digital audio signal of these devices and converting the audio to analog using the high performance SABRE32 Reference DAC, music from your favorite portable device will sound its best. Furthermore, for users with high-resolution music playback apps, the HA-2SE does not require the use of a Camera Connection Kit (CCK). The data cables that come with your Apple device or the supplied Lightning cable is sufficient. The HA-2SE’s micro-USB input port works with Android devices that support USB OTG (USB On-The-Go) and USB Audio Class. A special USB OTG cable is supplied with the HA-2SE to facilitate the connection. When used with a compatible Android device, the HA-2SE can support the device's built-in music app, tones and notifications. Additionally, a high-resolution music playback app can use the HA-2SE as its external DAC to play lossless PCM and DSD audio files. The HA-2SE functions as an external battery pack to charge your mobile device. Utility and convenience are factors we wanted to address with the HA-2SE, so you can ditch the bulky spare battery pack and carry just the HA-2SE with you mobile phone. 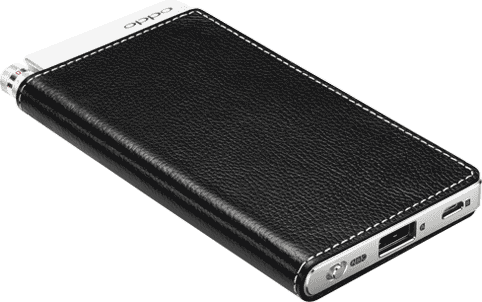 The HA-2SE features patented VOOC rapid charging technology from OPPO. Using the supplied rapid charger, the internal battery can be quickly and safely charged to 70% capacity in about 30 minutes. It only takes approximately 90 minutes to fully charge the battery. A quick charge gives the HA-2SE hours of operation time. The HA-2SE is housed in an aluminum chassis wrapped in genuine leather. The beveled metal edges and contrast stitching on the leather are eye-catching. Its fit and finish will instill a sense of pride when using the product. The HA-2SE meshes equally well in the pocket of an urban Millennial or on the desk of a business executive. Digital: USB A for iPod / iPhone / iPad; USB micro-B for smartphones with USB OTG feature and computers. “Made for iPod”, “Made for iPhone”, and “Made for iPad” mean that an electronic accessory has been designed to connect specifically to iPod®, iPhone®, or iPad®, respectively, and has been certified by the developer to meet Apple performance standards. Apple is not responsible for the operation of this device or its compliance with safety and regulatory standards. Please note that the use of this accessory with iPod, iPhone, or iPad may affect wireless performance. iPad, iPhone, iPod and iPod touch® are trademarks of Apple Inc., registered in the U.S. and other countries. USB works with iPhone 7, iPhone 7 Plus, iPhone 6S, iPhone 6S Plus, iPhone 6, iPhone 6 Plus, iPhone 5S, iPhone 5C, iPhone 5, iPhone 4S, iPad (4th generation), iPad mini, iPod touch (5th generation). The HA-2SE's USB input B works with Android devices that support USB OTG (USB On-The-Go) and USB Audio Class 2.0. Not all devices are compatible. Optional USB Type C to Micro USB Cable required for use with USB Type C devices.